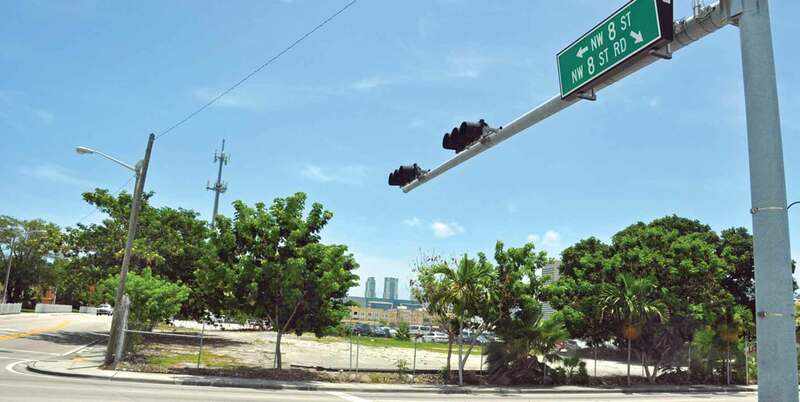 A large development that would include hundreds of multi-family apartments promises to breathe new life into a neighborhood near the convergence of the Miami River and Seybold Canal. River Central is a planned mixed-use residential development to include 633 rental apartments in two eight-story buildings connected by a centralized parking garage, with two 1,500-square-foot commercial spaces, at 650 NW Eighth St. The city’s Urban Development Review Board recommended approval of the project. The site is an entire block of uneven concrete used as a piecemeal parking lot that’s home to a hulking cell tower, adjacent to a scattering of rundown and abandoned parcels, blocks of chain-link fence and rusted barbed wire. To the north sit several older two-story apartment buildings. The large parcel is about a half block east of the canal and two blocks north of the river. Redevelopment of an entire city block at that location can serve to “energize the riverfront,” he said. The design of the buildings, from Arquitectonica, is formed to break up the block and would be accented with “art modeled after the river – meandering,” said Mr. Fernandez. Architect Anne Cotter showed the board renderings of the project and said although it takes up the entire block it is broken up by length and dimensions into two parts. Each building creates a large courtyard, developed with landscaping, swimming pools and other amenities. The residential buildings are shorter and the massing is broken up by varying heights of the roof edges and balconies, she said. Some balconies will be recessed while others with project out, and they will be painted in different colors, she said. The planned retail component will be ground level. The project will include a pedestrian walkway 30 feet wide, she said. Ms. Cotter told the board they are striving to build a neighborhood centrally located to the river the hospital and the Marlins ballpark. Board member Willy Bermello said the plan lacked detail. Some board members suggested more retail floor space for the project. “This neighborhood is in transition,” responded Ms. Cotter, who said they didn’t want to plan a lot of retail and have it remain vacant for long periods. The board’s motion to recommend approval of River Central included recommendations that the developer consider relocating the pools and consider additional retail along Northwest Seventh Avenue.